One critical aspect of maintaining and caring for your swimming pool is to maintain the right chemical balance of sanitizers, algae-killing, and chlorine solutions. This takes lots of trial and error, practice, and headaches. Luckily, there are a few tricks you can try to make caring for your facility easy and simple, one of which is the use of the best chlorine tablets (tabs). Choosing the best tabs, however, can be difficult if you do not have the knowledge and experience of using them, and the fact that they all look the same only makes the matter worse. But don’t worry; we will give you a comprehensive guide of how to buy these products. 1 What Are Chlorine Tabs? 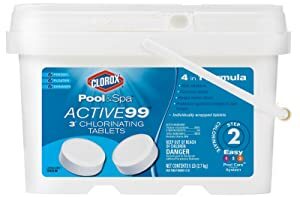 5.1 In The Swim 3 Inch Pool Chlorine Tablets 50 lbs. When the level of pH in your pool is unbalanced, it may be a chlorine problem and you may end up with a swimming pool that looks dirty or corroded and even get eyes and skin irritation. Adding chlorine tabs will make your pool look clean and also make it safe for use. Chlorine tablets are one form of chlorine you should add to your swimming pool. They come in cubes that are simple to add to your pool and spread out easily. These solid balls have chlorine that eliminates any type of bacteria and disinfect your pool. Before you visit the stores to search for the best chlorine tablets for your pool or spa, you need to know that there are two major types of these products. There are the stabilized chlorine tablets and the unstabilized chlorine tablets. Stabilized tabs are suitable for outdoor swimming pool while unstabilized ones are perfect for indoor pools. Stabilized tabs have longer lasting power than the unstabilized ones. The reason behind this is that the former are exposed to sunlight (the more the exposure the better) and they clean your pool better. It is good to note that the unstabilized tabs don’t work well when exposed to the sunlight (their power decreases). 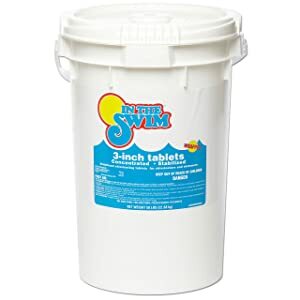 Chlorine tabs are cost effective and come in big packages; good enough to last you the entire season. You don’t need to keep on buying these products, wasting money and time. Instead of sprinkling liquid or powder all around your swimming pool, all you have to do it drop the tab and leave it to spread, with the aid of your swimming pool pump. Unlike the other forms of chlorine which you need to spread manually, chlorine tabs spread themselves, saving you lots of effort and time. These products come in form of tablets and hence, they are very easy to measure when determining how much you require for your pool. You do not need to weigh them or mix them with anything. Just pick the right number of tablets as recommended by the manufacturer, and then drop them into your pool. You can use these products in your pools, Jacuzzis, and spas. We have already looked at the two types of tabs. We only need to add that these products are found on either tablets or sticks. Sticks are ideal for outdoor pools and are bigger while tablets work better in chlorinators. So, don’t be confused which one to buy. There are two sizes of chlorine tabs: 1 inch and 3 inches. The size you will use will depend on the size and type of your dispenser as well as the volume of your swimming pool. A dispenser might hold just one tab or more than one. The number of tabs required per 10K gallons of water is usually shown on the label or in the instructions. Follow these instructions to know the right dosage for your pool. You might want to chlorinate your facility every week. To save money and time, you should purchase these products in bulk and even buy buckets. 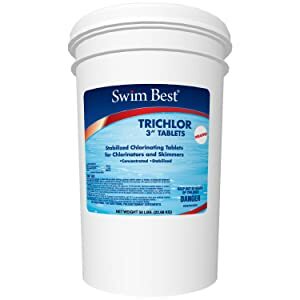 Trichlor tabs will offer up to 90% of chlorine. This means that they have more chlorine and hence, you need fewer products to treat your pool. This means that the product will contain an additive known as Cyanuric Acid that will protect it from sunlight. There are thousands of superb brands, with attractive names like Sock-it and Burn-out. However, if you go through their labels, you will have an idea of what active elements are in them. Compare these elements and find out what your facility needs. This product contains powerful 99% Trichlor-s-triazinetrione and 90% stabilized chlorine with the perfect dosage set at one to two tabs per 10K gallons of water every seven days. The tabs depend on the temperature of your pool and sunlight to work properly and every bucket contains 114 tablets. 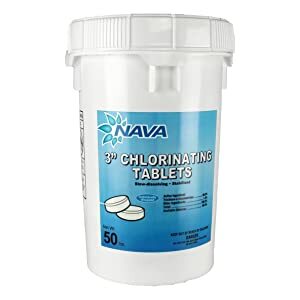 Widely advertised as the longest lasting and the slowest dissolving chlorine you can get, these tabs are wrapped individually for additional protection. The buckets are waterproof, safely locked up, and quite strong to ensure that you get the best protection. In addition, these tabs aren’t put straight into the bucket after individually wrapping as they are first put in a plastic bag. Another great protective measure that ensures you do not get chlorine dust on your hand. They dissolve evenly and slowly. They do a good job and are affordable. These tablets are stabilized to minimize chlorine loss to the UV rays. They are made to resist disintegrating and they contain 85.5% active chlorine and 95% Trichloro-s-triazinetrione. The tabs come in one-inch size but are very effective in maintaining steady and strong chlorine level for your facility. The best thing about these products is that they are very easy to fill to your chlorinators or floaters. For hot tube fanatics, these are the best tabs since they are very convenient and fit well in smaller floaters. They are also perfect for inflatable or above ground swimming pools. They are perfect for small pools. They offer value for your money. They don’t work well for hot tubs. These tabs will keep your pool clean and ready for use any time of the day. They help to disinfect the water and do not cloud it after you drop them in your pool. They are great for feeder baskets, skimmers, and floaters and dissolves evenly and slowly to make sure that they cover all corners of your pool. The best thing about these tabs isn’t that they dissolve slowly and steadily but that they are highly concentrated to provide maximum safety. The other feature of these products is that they do not stain your pool or even leave buildup. These tabs are EPE certified to ensure that you use only safe products. They spread slowly and evenly across your pool. 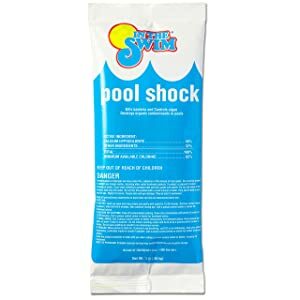 In The Swim Chlorine Pool Shock is a reliable and easy to use product which also happens to be affordable. The tabs feature an active ingredient known as Potassium Mono Persulfate that makes up about 50% of the product. 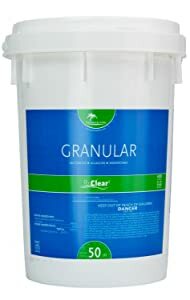 This product removes developing algae and kills harmful bacteria in your pool. The shock works better in a facility that has been sanitized with bromine and removes dead chlorine cells to provide a chlorine-free reading. This is a great product to use when shocking your pool. The other feature of this product is that it improves the condition and health of your swimming pool water. The shock deters the growth of algae and bacteria. It works in pools sanitized with bromine. You can use your pool immediately. It does not improve the chlorine level. This product controls algae development and kills bacteria in your swimming pool, keeping it clean and ready for swim 24/7. The tabs are stabilized to make sure that they last longer under the harmful UV rays and are each wrapped for better protection. You can use these tabs every week in your floater, feeder, or skimmer to ensure that your pool is fresh. The product features 99% active Trichloro-s-triazinetrione and improves the health and condition of your swimming pool. Ensure that you do not touch the tabs when dropping them into your pool to avoid skin and eyes irritation. They kill bacteria and remove algae. They work under the sun. They improve the health and condition of your pool. They aren’t effective in removing black algae. These tablets come in a 50 lbs. pack and lasts for an entire season. Although they are highly concentrated, they don’t leave buildup or stain in your pool. The best thing, they are US EPA Approved and come in a well-sealed bucket which is easy to open. For the size, the price is reasonable and you can spot them among other brands with ease. These individually wrapped three-inch tabs will keep your pool sanitized and will fit in all chlorinators and floaters. Furthermore, they dissolve slowly and offer a long-lasting effect. They don’t leave mineral buildup. They come in a well-sealed bucket. They crumble easily especially if they are about to expire. RX Clear is a product that will offer you better quality at the best price possible. They dissolve slowly and last you for a whole season, saving you the hustle of hitting the market again. They feature 90% chlorine and 99% Trichloro-s-triazinetrione to ensure that they are amongst the best out there. At only 15g, they are lightweight and easy to use. The best thing is that every tab is wrapped individually to ensure that you get the much-needed protection. This is a heavy-duty unit that works with one-inch tabs of either bromine or chlorine. It is easy to adjust to get the right amount of chlorine needed for your pool. This is the easiest method because it involves sprinkling the products across your facility. Before you start sprinkling, ensure that you wear gloves to avoid the irritating effect of the tabs when they come into contact with your skin. Also, wear protective glasses to avoid accidents of dissolved tablets spilling into your eyes. After that, measure the volume of water in your swimming pool. Add one tab for 5K gallons of water (read the manufacturer’s instructions). To make it easier, round up the volume of water in your pool to make sure that you sprinkle the right dosage of chlorine tabs. Sprinkle the chlorine pucks at a single point of your pool, leaving it to spread through water circulation as this will prevent your pool systems from corroding. This approach isn’t effective since the product isn’t spread evenly across your pool. Furthermore, it is hard to compute the right output of chlorine level that will provide the right protection. You can use a chemical dispenser or floater for all types of swimming pools. Open your floater and add the tabs (two or three). Always remember to wear protective gears like goggles and gloves to avoid an accident. After adding the tablets, cover your dispenser to ease the spill of conc. chlorine pucks into your pool. Adjust your dispenser according to the required amount of chlorine. Leave it to float on your pool for a specific time – until all the tabs have dissolved. One problem of using this approach is that it might hang around the perimeter of your swimming pool. This will dissolve the product in one part of your pool and it might even bleach the wall or liner. Furthermore, dispensers don’t allow the water to flow through them and hence ineffective. First, you need to start your pool’s pump and leave it on for about 10 minutes to remove the air that may have entered the lines. Just like the other two methods, wearing gloves and goggles is a must to prevent the irritation of your eyes and skin. Remove the cover of your skimmer and then remove the container of the chlorine. 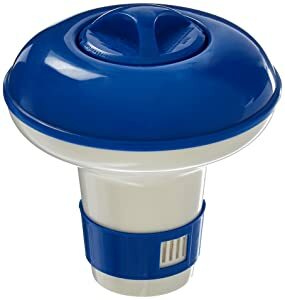 Add the product slowly into your skimmer in order to avoid spilling it into your pool’s tile or pool. Make sure that the filter is operating to move the water swiftly over the tabs dissolving them gradually. The skimmer will carry the dissolved tabs via the return jets facilitating the chlorine to spread evenly across your pool. The final step is to put the skimmer cover and leave it to run for about 2 hours before you dive into your swimming pool. We would recommend you to always take out the chlorine container when adding new tabs or when turning off the pump. This is the most effective approach of adding these products into your pool. The chlorinator is placed at the point where the water enters your pool. Add the pucks into your chlorinator. The device will allow the tabs to dissolve at a set rate to maintain the right amount of chlorine in your swimming pool. The best thing is that you can use the “dial on the unit” feature to set the chlorinator to provide the right level of chlorine. Use the middle of the dial to determine the perfect numbers of pucks to add to your chlorinator. Check the tablets every 2 days to find out how many have been dissolved. Turn the dial down or up depending on how slow or fast the products have dissolved. You can use the test strips to check the chlorine reading. Furthermore, you may use a timer to set when your pump should operate so as to dissolve the tabs. Using chlorinator is the best approach of adding chlorine to your swimming pool since it doesn’t bleach your pool because it regulates the amount dissolved into your pool. Additionally, it saves you time since it enables huge amounts of chlorine to be released at a go. Choose the right approach according to the options available and your needs, and also weigh the pros and cons of every method. For instance, adding tabs in a skimmer will result in an acid build up when the pump is off. The acid will damage gaskets and o-rings over time. If the fatal build up happens during the summer, you will not be able to use your swimming pool and it will cost you money to replace the parts affected. Again, do not drop the tabs directly into your swimming pool: without a floater, these tabs will lead to fading of liners and even stain the plaster. These products are also easily sucked into the drain where they dissolve faster. Apart from wasting the tablets, this will result in an imbalance in your swimming pool. Buying the right accessory will save you money and time when adding chlorine tablets to your swimming pool. Q: Why should I compute chlorine demand of my swimming pool? A: Some pool owners complain that their pools turn cloudy when they use chlorine tablets. These issues are genuine since they haven’t experienced the desired result even after spending lots of money. The major reason why your pool water doesn’t show any change is that you haven’t used the right amount of chlorine. Add fewer tabs, and bacteria and algae will remain and develop in your pool. Add excess, and your facility will turn cloudy. Therefore, computing the chlorine demand of your facility will ensure that you add the right number of tabs in your pool. Q: What is the difference between stabilized and unstabilized tablets chlorine? A: By now you know that there are two types of chlorines: Stabilized and Unstabilized chlorine. Their major difference is that stabilized chlorine works effectively when exposed to sunlight while unstabilized chlorine losses its power if it is exposed to sunlight. This means that stabilized chlorine is recommended for outdoor swimming pools while unstabilized one is perfect for indoor swimming pools. Q: Why do I need chlorine tablets? A: Have you ever watched a film with a stunning, fresh pool? This is made possible by chlorine tablets. As long as your pool has the right amount of chlorine, it will always be free of bacteria and algae and always look and smell fresh. Harmful bacteria and algae form in stagnant water. Hence, it is necessary to remove them through chlorination. Q: What is the basic ingredient of chlorine tablets? A: The primary ingredient of these products is calcium hypochlorite which is often used in treating water to disinfect it in swimming pools. The tabs also feature Cyanuric Acid, so ensure that you check its levels before you buy the tablets. Q: How do chlorine tablets work? Chlorine tabs dissolve in your pool’s water and then make it acidic. This acid, light acid, interacts with bacteria and algae and sanitize your facility surfaces and water.